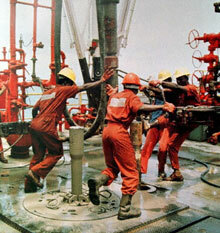 An undated photo shows Nigerian workers manning an oil rig (Photo: AFP). The west African oil rush is in full swing, with consequences that will reach down to the southern end of the continent and beyond. The islands and states around the Gulf of Guinea in particular are attracting increased interest from global oil firms and Washington, which seeks to reduce U.S. dependence on Middle East crude. The United States is the world’s largest oil consumer. The rate of discovery of new oil reserves in Africa has been the fastest in the world in the past five years, according to the U.S. Corporate Council on Africa. Most of these new proven reserves have been found around the Gulf of Guinea. West Africa, mainly Angola and Nigeria, now supplies about 15 percent of U.S. oil imports, and U.S. officials project African oil could account for 25 percent of their country’s crude imports by 2015. A key factor in U.S. calculations is the role played in West Africa by the quota-setting Organization of the Petroleum Exporting Countries (OPEC) or, more accurately, the lack of a role. The only OPEC member in West Africa is Nigeria. One of the big questions for West Africa is the extent to which the U.S. flag will follow oil production into the Gulf. São Tomé and Príncipe’s President Fradique de Menezes is quoted in a recent article in The East African, published in Kenya, as saying his country has reached agreement with the United States for the construction of a naval base that will be able to accommodate aircraft carriers. Washington has denied that it wants to build a São Tomé base, though it is hinting at “coastal patrol issues.” Signs are that in the short term the U.S. administration may want to play down the role of West Africa as a source of oil that would replace Middle East producers. While Walter Kansteiner, the U.S. State Department’s top Africa official, said at the recent Corporate Council on Africa’s West Africa Oil and Gas Forum in Houston, Texas, that he considered West African oil of strategic importance, he said the United States had no “detailed battle plans” to extract oil from West Africa. “Some bureaucrat in Washington will not increase oil and gas development in Africa because he thinks it’s a good idea after looking at a map,” he said. “Market forces and geophysics, they will dominate the process.” A number of huge projects are about to boost substantially West African oil and gas production. Angola wants to nearly double its production in the next six years. The West African Gas Pipeline will link the Escravos gas field in Nigeria with the Ghanaian market. The Chad-Cameroon Pipeline, now the largest single investment project on the continent, will take Chadian oil to the coast for export. Equatorial Guinea is scheduled to bring 16 wells onstream next year. There are no proven reserves in São Tomé yet, but these are “prognosticated” at about 9 billion barrels. The country already has in place agreements with Nigeria on the sharing of revenue from a field straddling the territorial waters of the two countries. Duncan Clarke, the Johannesburg-based CEO of independent management advisers for the oil and gas industry, Global Pacific & Partners, says an increasing problem in these deals is likely to be the revenue split between governments and companies. For example, in some fields, the Angolan government takes about 85 percent of revenue, though this varies from field to field. Finding the share in which the government is able to maximize its revenue while not chasing away prospective investors is the challenge. One way or another, oil revenue holds out the prospect of transforming the region. Countries with small populations and large per-head oil revenue like Equatorial Guinea and the island state of São Tomé and Príncipe will be a great deal richer and no longer dependent on foreign aid. Chad, one of the world’s poorest countries, will enjoy a 50-percent boost to its government revenue in the next few years. Conflict over oil and oil revenue, of course, could also lead to wars. For South Africa, the West African developments will have a range of consequences. In the short term, however, Middle East producers are likely still to remain the country’s principal oil suppliers. Nevertheless, South African imports of Nigerian oil have grown from zero in 1994 to 6.5 percent last year. Angola supplied 1.2 percent. According to the South African Petroleum Industry Association, Saudi Arabia supplied about 40 percent of South Africa’s oil imports and Iran, 30 percent. South Africa is also likely to benefit from growth in the Angolan economy. An increasing number of South African companies, including retailers, contractors, and mining companies, are keen to either expand or start up operations in Angola now that the civil war has ended.